Power your own all-terrain, fully automatic Xrails through the jungle trails of Cozumel. These babies are made for fun! Each Xrail can take up to 2 people, so you can drive your own or ride along, it's up to you. Splash through mud holes and kick up dirt as you zip down the trails, laughing and feeling the nature. 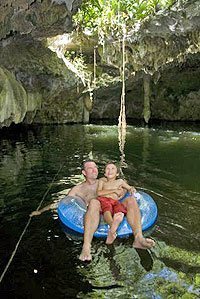 Deep in the Cozumel jungle, we'll arrive at our very special jade caverns. Stalactites and stalagmites fill the inside of these cenotes, and are surrounded by a beautiful ecosystem. We will cool off here with a refreshing swim in the emerald waters and relax in this magical, exotic place, before hopping back in our xrails and navigating the jungle trails for another 35 minutes or so, back to our tour meeting location. Dusty and grinning from ear to ear, you'll be ready now to head to beautiful Las Uvas Beach Club, where you can enjoy snorkeling on a beautiful coral reef and full use of all the facilities at the beach club. You can stay on the beach the rest of the day if you like, or you can return with us to town. Cruise Passengers: Yes! This tour makes a great shore excursion. Pick-up and drop-off at Jimmy Buffet's Margaritaville or at Playa Uvas is included in the price! When: Monday through Saturday at 9:00 AM, 10:00 AM, and 12:00 PM. Where: Cruise Passengers Meet at Jimmy Buffet's Margaritaville on the Waterfront Downtown or at Playa Uvas. Hotel Guests will meet at El Cedral or in certain cases at your Hotel. Exact Meeting Location will be Specified on Your Confirmation. Coming From Playa del Carmen? We will meet you at the ferry pier in Playa del Carmen and provide you with your ferry tickets. You will ride the ferry across to meet the tour. After the tour, we will give you ferry tickets for your return to Playa del Carmen. How Long: 5 Hours Approximately, but you can stay and use the beach club facilities for the rest of the day if you wish. Beach Club Note: We will return to town after the snorkeling. You can stay longer and use the beach club the rest of the day, but you will need to take a taxi from the beach club back to the ferry pier, your hotel, or your cruise ship. Kids: Must be 16 years old with a valid drivers license to drive your own X-rail. Ages 6 and up can ride on a shared Xrail. Kids same price as adults. $240.00 $240.00 FREE DRINK ! Prices are Per Xrail (Not Per Person), each Xrail takes 1-2 people. You are reserving the whole Xrail, so you will not be placed with others if you book only 1 person to a buggy. Prices are in U.S. Dollars and include all taxes and fees. Extra Money for Tips, Souvenirs, etc. Restrictions: Guests must wear closed toe shoes. Pregnant women or people with heart conditions, severe back or neck problems or epilepsy cannot participate in this excursion. Guests under the influence of alcohol or drugs will not be allowed to participate.